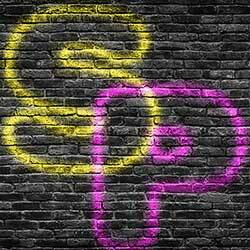 Learn how to create a spray paint text effect in Photoshop, with your letters spray-painted onto the background! A step-by-step tutorial for Photoshop CC and earlier. 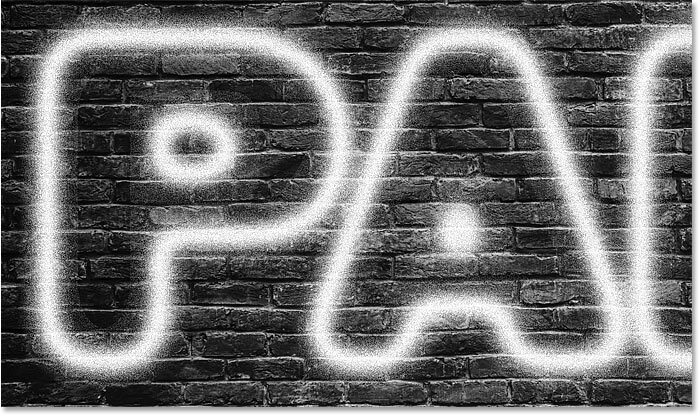 In this tutorial, I'll show you how to create a simple spray-painted text effect where the letters look like they've been spray-painted onto a wall or surface. I'll also show you how to blend the spay paint in with the surface for a more realistic looking effect. 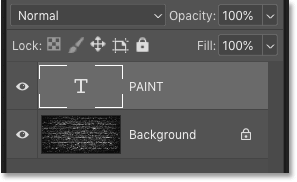 And because we'll create the spray paint using nothing more than a layer effect and Photoshop's blending options, your text will remain editable even when we're done. I'll be using the latest version of Photoshop CC but any recent version will work. We'll start by learning how to create the main spray paint effect, and then I'll show you how to blend the letters in with the background. I'll also show you how to duplicate the effect to add more text to your design, and how to change the color of the paint. The surface where the text will be spray-painted. Credit: Adobe Stock. 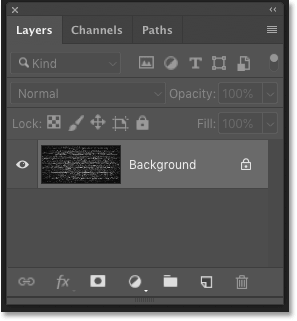 Photoshop's Layers panel showing the Background layer. Choosing a font in the Options Bar. Still in the Options Bar, I'll set my type size to 72 pt just to give me the largest preset size for now. And I'll set the text alignment to center. Setting the size, alignment and color of the text. Going to Edit > Free Transform. And then to resize the text, click and drag any of the corner handles. 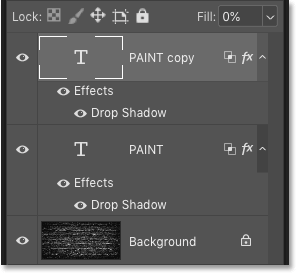 As of Photoshop CC 2019, the aspect ratio of the text is automatically locked as you drag the handles. In earlier versions of Photoshop, you'll need to hold down your Shift key as you drag to lock the aspect ratio in place. 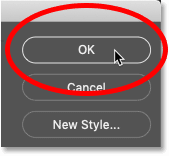 To resize the text from its center, press and hold the Alt (Win) / Option (Mac) key as you drag. And if you need to reposition your text, click inside the Free Transform box and drag the text into place. Resizing the text by dragging a corner handle. The text appears on its own Type layer. 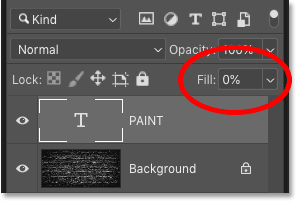 Lowering the Fill of the Type layer to 0 percent. Lowering the Fill value made the text invisible. What's the difference between Opacity and Fill? 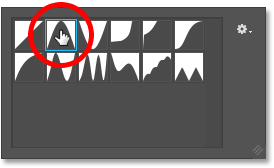 In the Layers panel, both the Opacity and Fill values affect a layer's transparency. The difference between them is that Opacity controls the transparency of both the contents of a layer and any layer effects that we've applied. Fill, on the other hand, affects only the contents of a layer. It has no effect on the layer effects. This means that by lowering the Fill value, we can apply layer effects to our text and keep the effects visible even though the text itself is hidden. And this is what's going to let us create our spray paint effect. Clicking the Layer Style icon. Choosing a Drop Shadow layer effect. Clicking the Reset to Default button. Setting the drop shadow's color to white. Changing the blend mode to Screen. A faint white outline appears around the text. Raising the opacity to 100 percent. The result after increasing the opacity. Setting both the Distance and Spread to 0. The result after lowering the Distance to 0px. Increasing the Size of the drop shadow. The result after lowering the Distance to 0 px. At this point, the effect so far doesn't look much like spray paint. Our glow needs to look more like an outline around the shapes of the letters. Click the arrow, not the thumbnail. The effect after switching to the Cone contour. 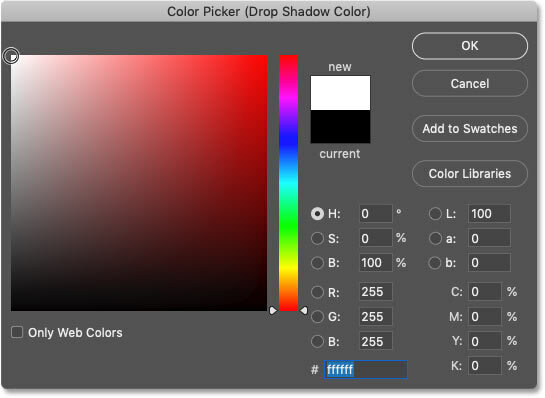 Step 13: Uncheck "Layer Knocks Out Drop Shadow"
But notice that even though our text is transparent, the glow only appears around the outside of it. We need to see the glow inside the letters as well. Unchecking "Layer Knocks Out Drop Shadow". At this point, you may need to go back and re-adjust the Size value to change the thickness of the outline. Don't go too high though or you'll spread the glow out too far. The exact size you need will depend on the size of your text. The effect after re-adjusting the Size value. Adding noise to the effect. And now, if I zoom in, we see little speckles in the outline, making it look more like spray paint. The effect after adding noise. At this point, we're done with our Drop Shadow layer effect. So let's learn how to blend the effect in with the background, so it looks like the text is actually spray-painted onto the background and not just sitting in front of it. When we’re done, I’ll show you how to copy the effect to add more text while keeping the layer effects and the blending options intact. 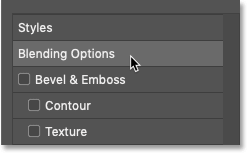 The "Underlying Layer" slider in the Blending Options. Notice the two sliders below the gradient bar. There's a black slider on the left and a white slider on the right. We're going to blend our text in with the darkest parts of our background image. And for that, we need the black slider. Dragging the black slider to the right. Dragging the black slider reveals the darkest areas of the background through the text. Hold Alt (Win) / Option (Mac) and drag the slider apart. The left half of the slider now controls the brightness level where the text begins to appear in front of the background. And the right half sets the brightness level where the text becomes fully visible and the background no longer shows through it. The area between the two sliders becomes the transition area where the text and the background are blending together. The further apart you drag the sliders, the more gradual the transition appears. Adjust each half of the slider until you're happy with the effect. There are no specific values to use here since it will depend on your background image. My brightness levels for the left half (10) and right half (60) of the slider. The effect with the text blended in with the background. Clicking OK to close the dialog box. The Type layer now shows our Drop Shadow and blending options. At this point, adding more spray-painted text is easy. Dragging the Type layer onto the Add New Layer icon. The Layers panel now showing both Type layers. Dragging the copied text to the top of the background image. Selecting the original Type layer. Dragging the original text to the bottom of the background image. 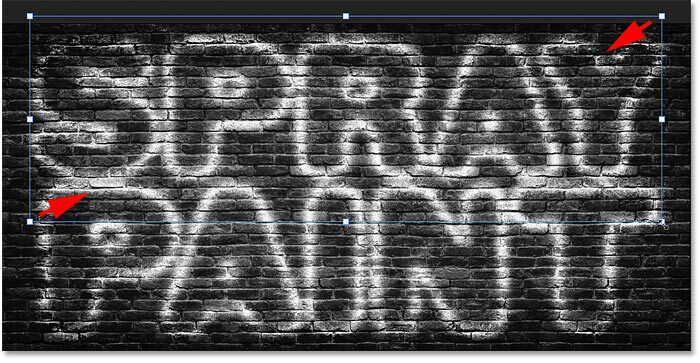 Since our text is still editable type, we can easily edit the text and keep the spray paint effect intact. Highlighting the top word by double-clicking with the Type Tool. Resizing the copy of the text. And finally, let's look at how to change the color of the effect. 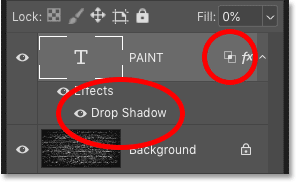 To change the color of the spray paint, double-click on the words "Drop Shadow" below the Type layer. 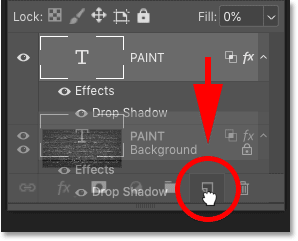 If you have more than one Type layer as I do, make sure you're double-clicking on the one you want to edit. 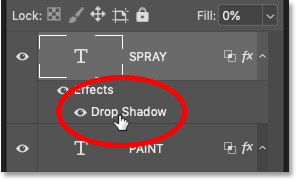 Double-clicking on the words "Drop Shadow". 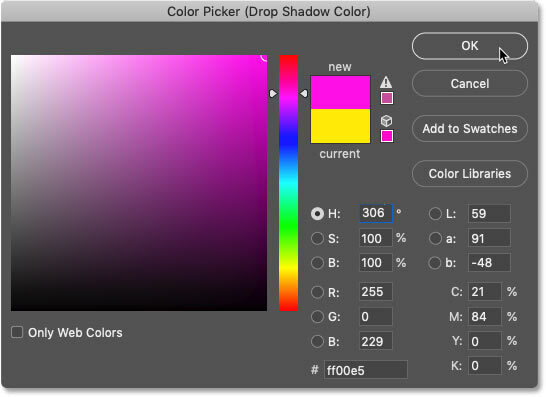 Clicking the Drop Shadow's color swatch. Choosing a new color for the spray paint. The result after coloring the top text. 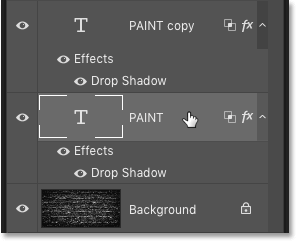 Reopening the Drop Shadow layer effect for the word "PAINT". Choosing a second color for the spray paint. 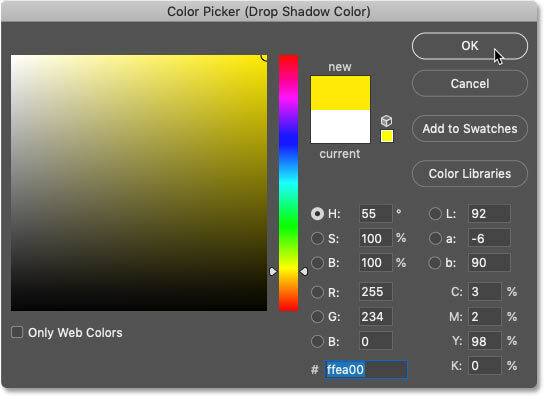 I'll click OK once again to close the Color Picker, and then OK to close the Layer Style dialog box. The finished spray-painted text effect. And there we have it! 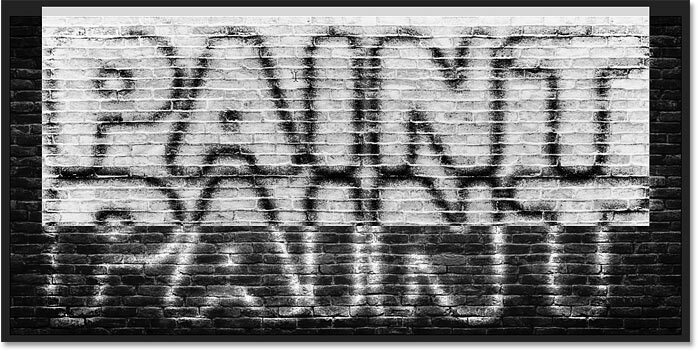 That's how to create spray-painted text in Photoshop! Check out our Photo Effects and Text Effects sections for more tutorials. And don't forget, all of our tutorials are available to download as PDFs!